Alive, Alive Oh! 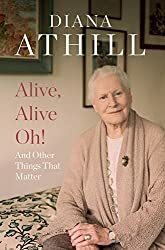 And Other Things That Matter by Diana Athill (published in 2015) contains memories, thoughts and reflections on her life as she approaches her 100th year (she was born in 1917). I quoted the opening paragraph of this book and a teaser paragraph in an earlier post, First Chapter, First Paragraph. It’s only a short book (168 pages), but it covers a wide range of Diana Athill’s memories, many images of beautiful places, and the friends and lovers she has known. The chapters follow on chronologically but are unconnected except for the fact that they demonstrate her love of life. She writes about her Great Grandfather’s garden at Ditchingham Hall in Norfolk, which she used to love visiting in the 1920s and 1930s, when her grandparents lived there. Her writing is so clear and precise, describing in detail its exact layout and expressing her delight in her memories of it. It is this love of life that is evident in her writing that makes it such a remarkable book. She writes about her decision to move into a home, persuaded by a friend who lived there and about how much she enjoys living there. And her main luxury now is her wheelchair, which she finds has unexpected benefits, such as when she was at an art exhibition – the crowds fell away from her in her wheelchair and she was able to lounge in perfect comfort in front of Matisse’s red Dance. I read about this somewhere else, possibly a review or exerpt in The Telegraph. Whatever, I will certainly keep an eye out for it as it sounds like a book I too would love. What a fascinating look, not just at one person’s life, but at the world as it’s been changing. And even from the short bit you’ve shared, I can see what you mean about her love of life, Margaret. I’m glad you enjoyed this. I got this one out of the library but didn’t have time to read it before going on holiday so returned it unread. I’ll definitely have to get it out again. I loved your review of this book. Lovely review – I’m going to look out for this one. A while ago I read ‘Instead of a book – letters to a friend’ and adored it. I recommend it if you haven’t read it already. I love her candour as well – nothing is off limits!